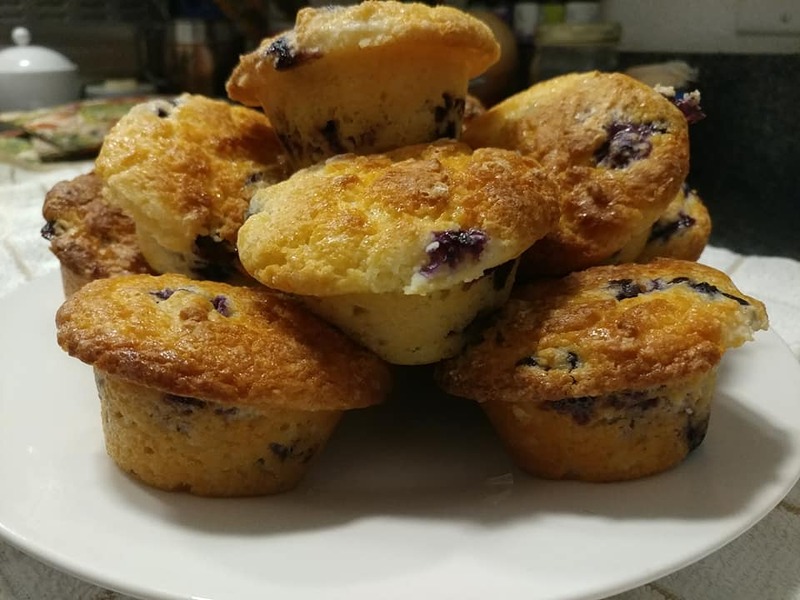 One of my morning favorites has always been Blueberry Muffins. I've made them before, but always from a mix, never from scratch. Until now. These muffins were so easy to make. Really, not much more to them than a per-made mix, but so much more delicious. They turn out super light inside with a bit of a crunch on the outside from the strudel. Blueberry muffins hot out of the oven. No strudel on top on this batch. Even though the batter itself appears really dry, I promise they bake up deliciously moist inside without being heavy thanks to the Greek yogurt. The trick is to mix everything by hand, no electric hand mixer or stand mixer. Just use a fork. If you over mix these they will become dense and tough. Step 1: Preheat oven to 350º. Sift Flour, Baking Powder, and Salt together into one bowl. Toss in Blueberries until coated with flour. Step 2: Use a separate bowl, it makes a difference. Whip 1 Egg until frothy. Whisk in Sugar one cup at a time until well incorporated. Add butter and whisk again. Finally add the Greek Yogurt and whisk until well blended. You can mix/wish the wet ingredients as much as you like. It is when you add the wet to the dry that you have to be careful to not over mix. Step 3: Pour the wet mixture into the dry and mix by hand with a fork until it just comes together. This batter will be thick, more like a cookie dough or a shaggy bread dough. Don't worry if you see pockets of dry flour. You want to be gentle with this and not over mix. Step 4: I don't use muffin/cupcake papers. Instead, I just sprayed my muffin tins with a good non-stick spray and they pop right out. Using a spoon or ice cream scoop fill muffin tins. This recipe will fill each muffin tin to the top, so when they bake they get that pretty mushroom-style muffin top. In other words, this makes nice, big, fluffy muffins. Step 5: In a bowl (I just use one of the ones I have already dirtied, wet or dry bowl, doesn't matter) mix Strudel ingredients by hand until it is crumbly. Sprinkle mixture on top of each muffin. Step 6: Bake at 350º for 25-30 minutes, or until tops are just golden brown. Rotate tray half way. Blueberry muffins with strudel topping. Step 7: Remove from oven and let cool for 1 minute. Invert tray and remove muffins. They should pop right out. Continue to cool for 3-4 minutes. Enjoy with fresh butter, honey butter, with a glass of cold milk or hot coffee. Yum! Blueberry muffin is light, fluffy, and moist on the inside with a slight crisp on the outside from the strudel.